Churches need to demonstrate good stewardship. Especially if you want people to donate hard-earned money to your ministry. No one wants to give to a non-profit that looks wasteful. Communication is often seen as a disposable and temporary item. You promote an event for a few weeks and it’s done. But this isn’t ultimately the case. Things like website content needs to live on in the archive world. Quick tip: invest in long-term communication and reduce costs for the short-term! 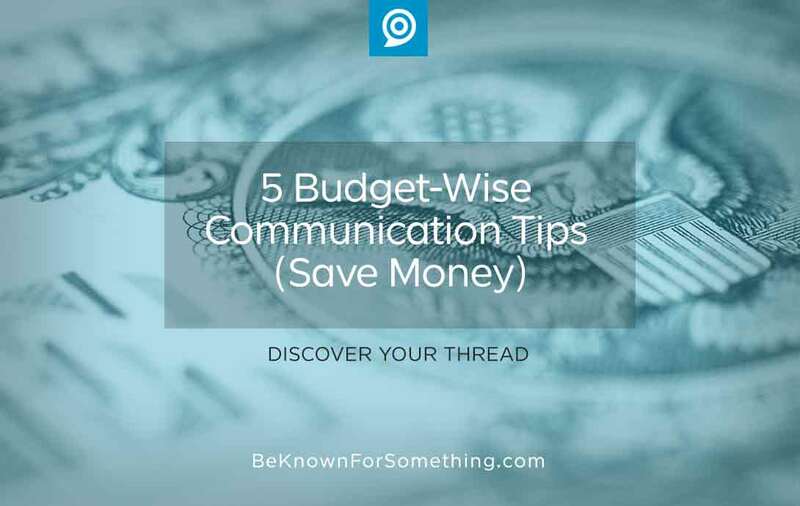 Here are 5 budget-wise communication tips that’ll save money without aggravating your congregation (too much). Yet, number 4 may stretch some churches! Edit. Edit. Edit. Reduced attention spans have limited how much communication we’ll accept. Rarely will anyone want more when less is fine. Try to remove every unimportant word from promotional content. Do the hard work and provide “just the facts” that would make them decide if they’re interested or not. How does this save money? Paper costs. As more and more reject paper communication, reducing the size of your bulletin and newsletter is wise. And it’ll save lots of money too while encouraging people to actually read it. More and more people are reading less and less. Post videos on (free) YouTube and connected the videos to your website. This will ultimately save expensive hosting storage costs PLUS it adds value since your videos become discoverable on YouTube (which young people treat like a search engine)! More people are searching on that site and very few will ever even discover your website so this is a win-win! Develop Volunteers. I’m fully convinced that many tasks that a church communicator does should be done as a ministry by a volunteer. All ministry leaders should be mandated to mentor, supervise, and encourage people within their congregation to serve or minister. This shouldn’t be done to save money alone but to encourage the use of spiritual gifts. One caveat: if the volunteer role’s expectations are treated like a job that should be compensated (or the volunteer is fully-trained and needing occupation) perhaps the role should be paid. Kill the Bulletin. As stated in point 1, many are rejecting paper bulletins for communication. If you’ve been shrinking this device AND have a trusted, online presence that’s easy to navigate with a calendar of events that’s easy to filter AND don’t have a service that relies on the handout PERHAPS it’s time to kill the bulletin. Transitional step: stop giving them to everyone and allow them to pick them up. You’ll be surprised how few will be requested! Use Screens instead of Posters. Having a digital screen mounted with the ability to promote events in your church will save lots of money and be more effective in the long run. Eliminate bulletin boards and start running simple promotional screens that are directed to the demographic that might see them. Scared there’s not going to be enough details? Don’t be. Simply allow the screen to get their attention and point to your website.